The effect of pre-exposure color on foveal dark adaptation was investigated. Monocular absolute threshold curves were obtained for two observers with white, red, green, and blue test patches after white, red, green, and blue pre-exposures. All combinations of pre-exposure and test-patch color were measured for each of two sizes of centrally fixated test patch: 48 min; and 2 deg 16 min. The pre-exposure field was centrally fixated and subtended 10 deg. The pre-exposure luminance and duration was 100 ft-L for 100 sec prior to threshold determinations with the smaller test patch, and 10 ft-L for 10 sec prior to threshold determinations with the larger test patch. The duration of the test flash was 0.033 sec. 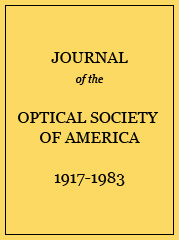 The results indicated the absence of pre-exposure color effects in the rod-free fovea, with the exception that pre-exposure to red light reduced subsequent sensitivity to the long-wavelength part of the spectrum to a slightly greater degree than did pre-exposure to any of the other colors tested. The results for the larger rod-populated foveal area demonstrated effects consistent with the scotopic luminance of the pre-exposure colors which were used. The average range, expressed in log ft-L, for each dark-adaptation curve in Fig. 2 (48-min test patch). The average range, expressed in log ft-L, for each dark-adaptation curve in Fig. 3 (2-deg 16-min test patch).